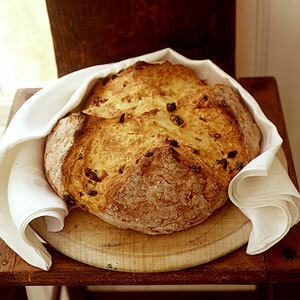 From Gourmet Magazine, the March 1994 edition, Jeanne Lemlin writes: “The following bread, found throughout Ireland, is chock-full of raisins and caraway seeds.” (p. 175) It has become a tradition in my house on St.Patrick’s Day and is easy and delicious enough to enjoy all year round! In a large bowl whisk together flours, sugar, baking soda, and salt. Add raisins and caraway seeds and toss until coated. Add buttermilk or plain nonfat yogurt and stir until dough is moistened evenly. Do not overwork dough. On a floured surface knead dough 1 minute, sprinkling lightly with addition flour to prevent sticking. (Work it until the dough does not stick to your hands, may be a but tacky, but mostly dry.) Shape dough into a ball and put in baking dish. With a sharp knife cut a shallow X (or cross) in top of loaf and brush loaf with milk. Turn bread out onto a rack and cool completely before slicing. You can use dried currants instead of raisins if your store carries them. What is the oven temperature please? TY! Thank you for catching that! The temp would be 350 degrees F.